Back in August, I received a roll-on fragrance in MyGlam bag. You can read my review HERE. 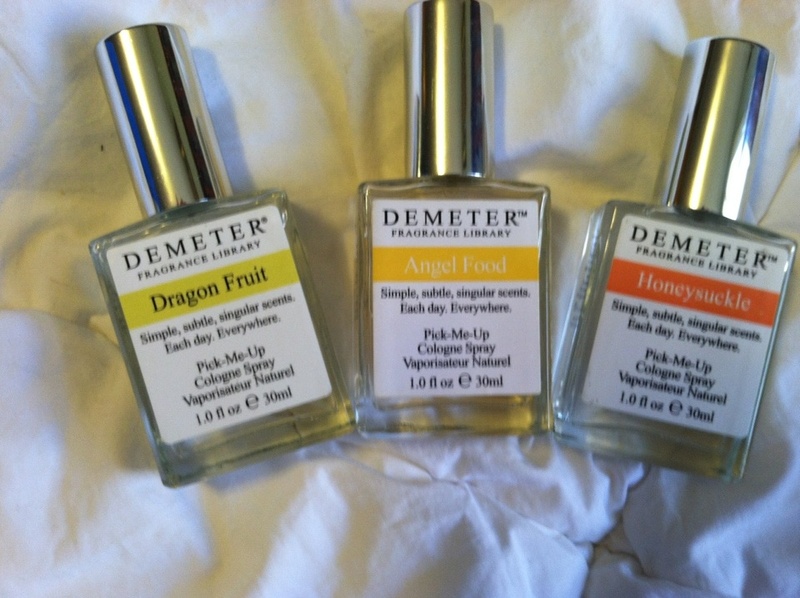 The roll-on fragrance was from Demeter and it was a Dragon Fruit. It was so delicious, and I noticed when I wore it, it made me a little happier. It reminded me of my trip to Hawaii and the amazing fresh Dragon Fruit I had there (read about it HERE). It was so powerful, that I started carrying it with me everywhere, because it was really effective not at just making me smell amazing, but enhancing my mood. I was thrilled to try 3 more scents from Demeter. Two new scents in their original spray (plus the Dragon Fruit), and 1 more roll-on scent of Clean Skin. I love that they are called "Pick Me-Up" scents, because that is really what they are. Angel Food smells EXACTLY like Angel Food Cake and it makes me VERY happy. Honeysuckle reminds me of Spring and relaxes and calms me. I am a SUCKER for anything with a clean scent, and I loved that the Clean Skin came to me in the roll-on variety. I actually keep it in my desk at work, and when I become stressed, I apply it to my pressure points and the stress at least STARTS to melt away! It completely love it! Demeters sells a HUGE variety in scents including the ones here as well as odd scents such as Grass and the apparently popular Dirt. I strongly recommend thinking of a scent that makes you calm and relaxed, or that makes you happy, and ordering that scent. You will NOT be disappointed! MamaBreak received product to review here on MamaBreak. MamaBreak did not receive any other kind of compensation. As always our experiences and our opinions are our own. I love fruity and food scents the angel food cake sounds fantastic! I will have to check out Demeter as I haven't heard of them before. I love different scents! I have never heard of them! Thanks for sharing!!! i love fruity & flowery scents too. I love flowery scents, but I have never heard of this company. I do want to give them a try, they sound nice! The word Hawaii sounds good and if the fragrances reminded you of hawaii then must be a really good product as well as the scent. I love fruity and not so strong scent. I would love to try one of these! That is so cool I've been wanting to try these out but I was hesitant until now.